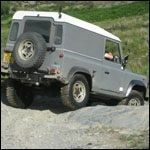 im looking at buying some second hand wheels off a defender 90 for my s3 swb. Are the studs the same centres? Be careful about the hub centre, though, I think the series hub is bigger, thus some rims don't fit.